My family is a bit picky when it comes to granola bars. They tend to like the not-so-healthy store bought kind, the kind with weird sounding ingredients. I’ve tried make homemade ones in the past, and while they were perfectly tasty they never had the same consistency that my family seems to like in the store bought ones. I’ve experimented with different variations, trying to come up with something with no refined sugar or corn syrup. My past attempts have been dismal at best. THIS attempt however, I would say is a success! The secret is brown rice syrup, which adds the brown sugar flavor that I think I’ve been missing. If you’re wondering where the heck you find brown rice syrup, it’s really much easier to find than you’d think. You can get it at any health food store, but I actually picked mine up at Wal-Mart of all places. It was in the syrup aisle, and is actually a maple syrup substitute made from brown rice syrup. These bars are a bit of a kitchen sink experiment, with white and milk chocolate chips, raisins, and leftover crushed up dulce de leche cheerios. Straight from the oven they were more of a cookie consistency, but the next morning they settled and had a great soft and chewy consistency, which lasted for several days. They were so good that I’m already planning my next batch and all the variations I can try! *UPDATE: After doing some research, it seems that brown rice syrup may be questionable in it's safety. If you'd like to find out more and do your own research, I suggest you start with this article. For those that decide not use brown rice syrup, I'm thinking agave syrup or maple syrup may be a good substitute that will yield a similar result. Preheat oven to 325 degrees. Line a 9×9 pan with parchment paper and set aside. Place 3/4 cup oats, 1/4 cup of cereal, chocolate chips and raisin in a food processor. Pulse a few times to break up the ingredients. Don’t go crazy or you’ll change the consistency of your bar. Transfer the mixture to the bowl of an electric mixer. Add the baking soda, salt, vanilla, flour, oil, honey, and brown rice syrup. Mix just until combined. The mixture will form a soft dough that resembles a cookie dough in texture. Fold in the remaining 1/4 cup of oats and 1/4 cup of cereal until combined. Lightly press this mixture into the prepared 9×9 pan. Bake for 15-18 minutes or until the bars are lightly browned on top. Remove from heat and allow to cool. Cut into bars, serve and enjoy! What do you like to do when you’re trapped in the house on a snow day? I’d like to say I spent countless hours cleaning and scrubbing my house, all while performing amazing super-mommy tasks. I would be fibbing just the teensiest bit though. Snow days are for searching the internet for new and delicious recipes to try, and for whipping up a recipe that uses scandalous amounts of butter and sugar…and if there’s even more butter and sugar dumped on top? I’m talking about Vanilla Crumb Pie people. If you’ve never tried this pie, you’re missing out. The warm vanilla filling is similar to pecan pie (sans nuts) and then it’s covered in a sweet, buttery crumb topping. This is another wonderful Tasty Kitchen recipe, submitted by Tonya of 4 Little Fergusons. Head on over to Tasty Kitchen to find this great recipe. Thanks Tonya for sharing this deliciousness! Since today is the start of National Pancake Week, I thought these pancakes would be a good start to kick it off. I’ve had this idea rambling around in my head for a while now, and what better time to try them out than a week dedicated to every kind of delicious pancake you can imagine? You’ve probably seen a ton of Cinnamon Swirl Pancakes making the internet rounds, but I had something different in mind. I love raisin bread, with the yummy cinnamon streaks and plump raisins filling every bite, and I just had to see if I could make a pancake version. Of course, if the raisins were rum-soaked and the pancakes were topped with a giant pat of Maple Butter, it couldn’t hurt right? These were so good, whether you drizzle them traditional syrup, or go with a powdered sugar glaze, they’re sure to please any crowd! For the Maple Butter: Mix the butter and maple syrup with an electric mixer until blended. Set aside. For the Cinnamon Swirl: In a small bowl combine ingredients for the cinnamon swirl, and pour into a plastic ziploc bag or a disposable pastry bag. Snip a tiny triangle off the end of the bag for piping. Set aside. Combine milk with vinegar in a medium bowl and set aside for 5 minutes to "sour". Combine flour, sugar, baking powder, baking soda, and salt in a large mixing bowl. Whisk egg, melted butter and vanilla into the "soured" milk. Pour the flour mixture into the wet ingredients and whisk until lumps are gone. 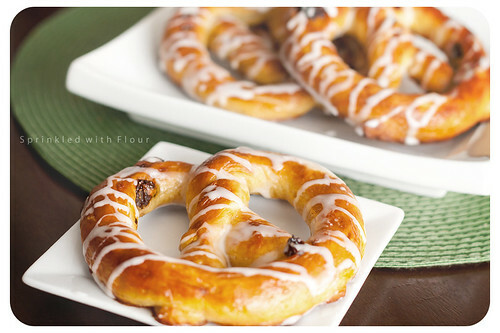 Drain the raisins and gently fold them into the batter. Heat a nonstick skillet over medium heat. Grease with butter, if desired, and pour on a 1/2 cup of batter. Use the pastry bag to make a swirl of the cinnamon sugar mixture on top of the batter. When the bubbles on the surface of the pancake begin to pop, and then no longer fill in with more batter, flip, and cook for 30 seconds more. Repeat with remaining batter. Top with the Maple Butter and drizzle with syrup or a powdered sugar glaze. How do you like your pretzels? I like the soft and chewy variety, the kind that almost melts in your mouth as you close your eyes and pretend you're in pretzel heaven. I've always had a soft spot (no pun intended) for a certain soft pretzel from a certain store in the mall. You know the one I'm talking about. Until now, I never would have thought I could enjoy one just as delicious in my own home...and they would be EASY to make. To make dough by hand, or with a mixer: Place all of the dough ingredients into a bowl, and beat until well-combined. Knead the dough, by hand or machine, for about 5 minutes, until it's soft, smooth, and quite slack. Since I wanted half plain and half raisin pretzels, I divided the dough in half at this point. Place the plain half in a floured bowl and turn to coat. 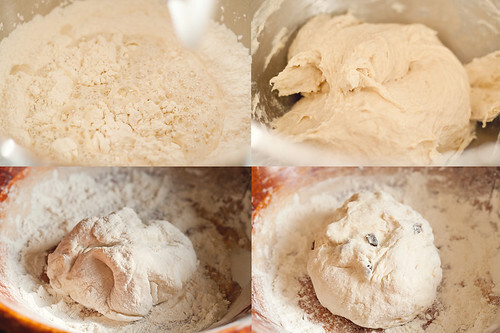 Add 1/4 cup raisins to the other half of the the dough still in the mixer, and mix until combined. 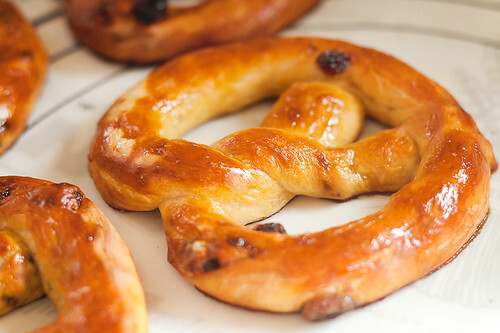 (If you want all raisin pretzels, use 1/2 cup raisins and there's no need to divide the dough in half). Place the raisin dough in the floured bowl and turn to coat also. 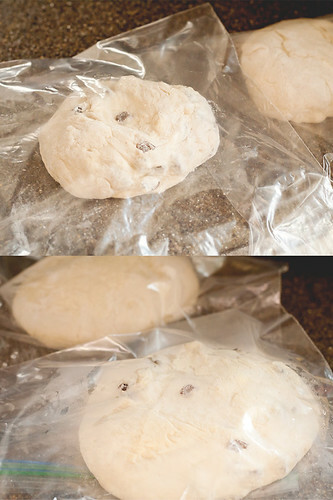 Take both halves of dough and place them each in a plastic bag, and allow it to rest for 30 minutes. While the dough is resting, prepare the topping: Combine the boiling water and baking soda, stirring until the soda is totally (or almost totally) dissolved. Pour the mixture into a pan and set aside to cool to lukewarm (or cooler). 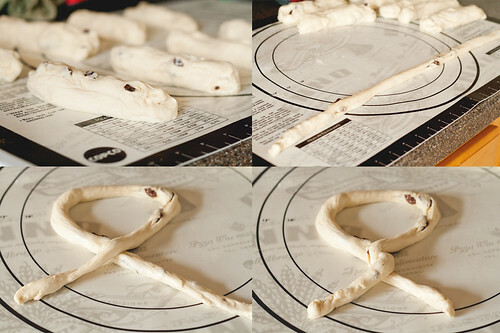 Roll each piece of dough into a long, thin rope (about 28" to 3" long), and twist each rope into a pretzel. 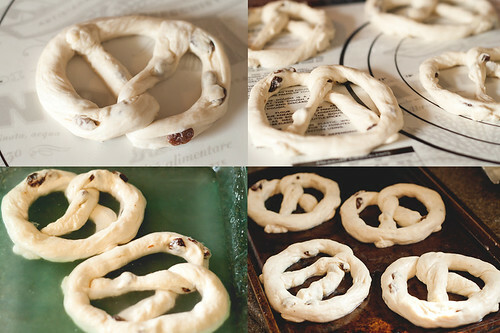 Working with 4 pretzels at a time, place them in the pan with the baking soda/water, spooning the water over their tops; leave them in the water for 2 minutes before placing them on the baking sheet. This baking soda "bath" will give the pretzels a nice, golden-brown color. Remove the pretzels from the oven, and brush them thoroughly with the melted butter. Keep brushing the butter on until you've used it all up; it may seem like a lot, but that's what gives these pretzels their wonderful taste. Mix together 1 cup of powdered sugar, 1/2 tsp vanilla, and enough milk to reach your desired pouring consistency. I used about 1-2 tablespoons of half & half. Drizzle the icing over the warm pretzels. Eat the pretzels warm, or reheat them in an oven or microwave. If you live at our house, and you happen to be a 5 year old little boy, the leftover baking soda bath can even be the ideal playground for your Lego men...after you've played with the dough and eaten way too many pretzels of course. Preheat oven to 350 degrees. Line cookie sheets with Silpats or parchment paper. In a large bowl, combine flour, soda, and salt. Stir together and set aside. In a large bowl, cream together butter and sugars until light and fluffy, about 3 minutes. Add egg and beat until combined. Add flour mixture and beat on low speed until well incorporated. Add orange zest and beat to distribute. Stir in chips. Use a cookie scoop or tablespoon to drop in rounded spoonfuls on cookie sheets, leaving plenty of room between cookies to allow for some spreading. Bake for about 10 minutes until light golden brown. Cool about 1 minute on cookie sheets and then transfer to wire racks to cool completely. Eat, enjoy, repeat as necessary!